Cleaning the home regularly is an essential part of maintaining a residence. Dedicated cleaning efforts not only keep a home looking its best for those living there as well as guests but also works to keep bacteria and harmful particles out of the equation, leading to a healthier living space. The problems that often arise when it comes to cleaning a home from top to bottom are the associated time and cost. Specially marketed cleaning products designed to clean everything from home appliances to windows and walls can be costly and often harsh on surfaces. Although it may be tempting to stock the cleaning shelf with every specialized spray available, it’s not the only way to achieve a clean home. In fact, there are many cost-effective methods that allow for sufficient home cleaning without breaking the budget. Here are a few room-by-room tips to keeping a home clean while saving money. The living room tends to be the area in the home most recognized for bringing people together. Generally filled with furniture, technology and entertainment, the living room is a social space that sees a great deal of foot traffic and lounging. One of the costliest parts of cleaning that room can be when large pieces of furniture require attention. In an effort to avoid spending extravagantly on upholstery cleaners, give a homemade option a try. Combine 1/2 cup of liquid dish detergent combined with 1/2 cup of water for extraordinary results on basic furniture stains. When it comes to carpeting, investing time in an efficient carpet cleaner is an effective way to reduce costs associated with hiring professionals. As easy to store as a vacuum and providing long-term results, a carpet cleaner that keeps living room carpet in wonderful condition doesn’t have to be expensive. Similarly, using an extendable reach duster to tackle hard-to-reach fan blades and window frames will reduce the amount of dust that regularly falls into carpeting, allowing for better air quality, less to vacuum and an overall cleaner living room. The kitchen keeps the family fed and, as a result, usually requires more cleaning attention than other rooms. Although all-purpose cleaners are a staple in nearly every cleaning cabinet, they can go quickly and become expensive to restock. As a strategy for saving money and keeping the kitchen clean, try a DIY all-purpose solution that’s environmentally friend, low-cost and gentle on surfaces. Combining 1 cup of white vinegar, 1 cup of water and 1 tablespoon of baking soda in a spray bottle is all it takes to create a highly efficient cleaning solution. Adding a few drops of a preferred essential oil gives counters a beautiful shine and leaves a lingering, pleasant scent. White vinegar also proves budget-friendly and useful when it comes to cleaning the dishwasher. Plenty of use can leave this appliance with an unusual odor. Simply running a cup of white vinegar through a hot cycle successfully removes grime and gives the appliance a fresh smell. In an effort to keep refrigerators looking sleek and shiny, consider wrapping stainless steel handles with a swatch of fabric. Easy to mix and match, adding this small detail can prolong refrigerator surfacing and (for those who live with little ones) can eliminate grime and fingerprints that require constant wiping. The most difficult part of cleaning any bedroom is finding ways to clean hard-to-reach areas. Most bedrooms come with fans, and the blades can quickly collect dust. As the fan is used, dust is thrown around the room, resulting in a more frequent need for vacuuming, moping or overall cleaning. 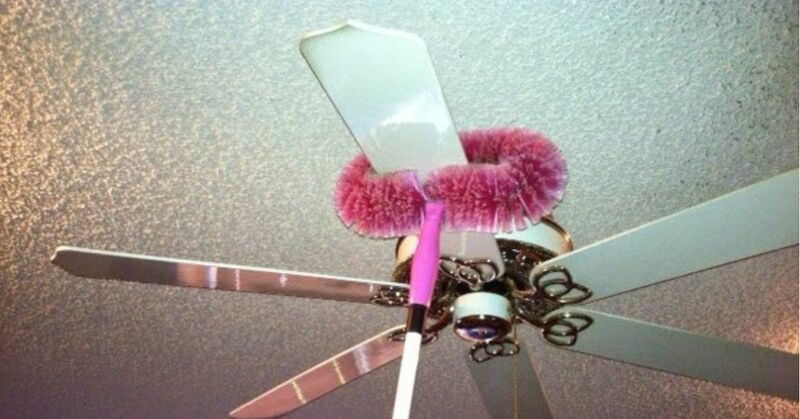 As a way to save on extendable dusters, consider using a broom and old pillow case for the task. As effective as dusting, this simple contraption is made up of household items and leaves a bedroom fan in pristine condition. Water costs associated with running the washing machine can make some homeowners crazy. Between the comforter, sheets, pillowcases and blankets, bedrooms provide much of the bulky laundry that costs time and money. When it comes to saving in this area, consider swapping out a cycle with a fabric spray. Safe, effective and easy to apply, fabric spray can cut laundry time in half and leave a room and fabrics smelling great. The bathroom is a space notorious for being exposed to chemicals on a daily basis. From hairspray to makeup, air freshener and perfumes, bathrooms take the brunt of the residual evidence left behind through the process of getting ready to face the day. As a place set aside for hygienic purposes, it’s important to keep bathrooms clean, and it's possible to maintain this standard on a budget. Keeping a spray bottle of homemade all-purpose cleaner under the bathroom sink encourages bathroom guests to simply wipe down the counter before they go. A single swipe after hairspray or make up is applied goes far toward keeping the bathroom in good shape and extending the life of surfaces. Similarly, investing in a new shower head when the current one gets blocked with grime and residue isn’t necessary. A more cost-effective solution is to take a few moments to dunk the shower head in a homemade cleaning solution. A simple mix of white vinegar and baking soda make for an efficient cleaner when it comes to dislodging mineral buildup in a shower head. Another problematic bathroom scenario that can lead to expensive cleaning requirements is shower wall buildup. Affecting tile and plastic equally, grime building up on shower walls can lead to unpleasant odors and slick spots that could be dangerous. Even though most people will turn to manual scrubbing to remove residue, keeping a squeegee in the shower is a simple and low-cost way to minimize buildup. Make sure to run the squeegee down the length of the wall after every shower or bath so moisture is quickly and easily swept away, resulting in less cleaning time. Perhaps the last room on anyone’s cleaning radar, the garage is a well-used room and as part of the house, should be attended to with equal effort. Two of the most common situations that occur in the garage leading to timely or costly cleanup include oil stains and clutter. Although the garage tends to be the place random items end up, it doesn’t have to be a space of chaos. Hanging a few portable shoe holders on the wall can transform these plastic pockets into perfect tool and knick-knack holders. Easy to mount and keeping clutter off the ground, this is a must-try solution for those hoping to save money and make the most of their garage space. For homeowners who park their leaky vehicles in the garage and are constantly trying to clean stains off the floor, all it takes is a cookie sheet and some cat litter to solve the problem. Fill a cookie sheet with litter and place it under the car where the leak occurs. Instead of staining the floor, oil is absorbed by the litter and can be quickly replaced as needed.